I would have nothing. It doesn't look like he hurdled the torso, or that the entire path was blocked . ... or that R3 altered his approach until after F2 had the ball (although this part is closer). R3 Out. Catcher must be LYING on the ground for a jump, leap or hurdle to be legal. Great video for illustrating how grey reality on the field can be very different from the black and white of the rule book. 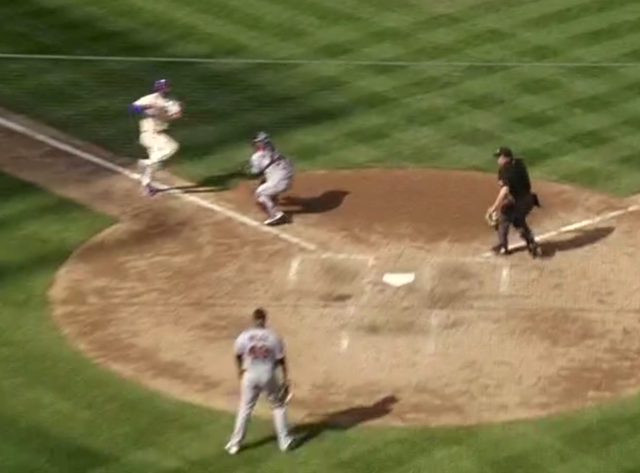 The point of the rule is that when a fielder is trying to make a tag, the runner is down to two options: slide, or attempt to legally avoid the tag. I've got him out because it's Bryce Harper. Interesting. I had a play today made me think of this FED rules Lets assume a play at the plate where F2 blocks the plate without the ball, of moved into the runners path without the ball, it’s obstruction. Runner reacts to F2 moving into his path by leaping over him. Diving is the only action that specifically states to supercede OBS. F4 is in the baseline without the ball (a) on both knees or (b) bending over. R1 hurdles, jumps, leaps or dives over F4. RULING: In (a) and (b), obstruction is ignored. If the runner hurdles, jumps or dives over the fielder, he shall be declared out. These illegal acts supersede obstruction. I'm calling R3 out in Fed. There is no question he jumped over some part of F2's body and could have torn his face off. In fact, it looks like he kicks the mask off. Rules that are designed to protect players against injury need to be interpreted that way. That's not a correct call. There's nothing particularly dangerous about jumping over an outstretched arm (indeed, running through it poses a greater injury risk). And besides: that's not the rule, except in the MSU book. I think any fed rules interpreter would tell you this is an out. He’s not jumping over an outstretched arm. He’s jumping over a fair part of his body and his arm isn’t outstretched by itself (he is holding the ball in his hand with the hand in his glove, making this impossible). He’s practically jumping over his shoulder and almost his head. Dangerous play. Easy out. I guess I’ll amend any to most. I don’t have this as close to a legal play for the reasoning above. It’s not simply jumping over an outstretched arm. Why would this be legal? The only reason a runner would leap would be to avoid a tag or a potential tag, or some obstacle or player in his way. It seems like we agree that the catcher was not literally in Harper's way in the OP. This means that as he neared the plate, Harper felt his best chance of avoiding the tag was to leap/hurdle. He failed to achieve that, and the tag was applied. This means that the catcher was put in the position of tagging a hurdling player from underneath, exactly the kind of unsafe tactic that the rule was meant to prevent. This could have easily resulted in an injury had the catcher been less athletic and tried to re-enter the base path to apply the tag. I had thought NFHS wanted the runner in this situation to either 1) stop and retreat, or 2) slide, or 3) attempt to avoid the tag by means *other* than diving/jumping/hurdling, such as getting around the tag. Hurdling is not a valid option with an imminent tag. Is this really a rules question, or more of a judgment as to whether the player was hurdling "over" a player? Technically he wasn't hurdling *over* a player. He was hurdling over what he anticipated would become a player in his path. 8.2.1 SITUATION D: R3 is on third with no outs. R3 attempts to score on a fly ball to F8. F8's throw to F2 is near perfect. R3 sees that the play is going to be close. As F2 stretches for the ball to tag R3, R3 attempts to hurdle F2's outstretched arms as the ball bounces in front of the plate and skips into dead-ball territory. As R3 is in the air, F2's glove catches R3's foot and both lose their balance and tumble to the ground. (a) R3 gets up and proceeds to the dugout or (b) R3 crawls back and touches the plate. RULING: Hurdling the outstretched arms of a fielder is legal. Hurdling or jumping over a fielder who is not lying on the ground is illegal. In (a), the umpire shall call R3 out for missing the plate upon a proper defensive appeal. In (b), R3's run would count. We know the rule. But again, his arms weren’t outstretched in my opinion. The situation above is simply not what happened in the video. Technically he wasn't hurdling *over* a player. He was hurdling over what he anticipated would become a player in his path. Then he didn't hurdle the player, did he? We can't rule a violation on what he anticipated would happen, we have to rule on what actually did happen. Also, @Thatsnotyou, if you judge he hurdled the player and not just the arms in your judgment, then by all means call it. My judgment is that it was the arms, and legal. One of the advantages of having video is that we can use it to assess judgment calls. We don't have a perfect angle to judge whether the runner went over the arm or the fielder, but I think we have enough. Here are 3 still images of about a half-second worth of action. 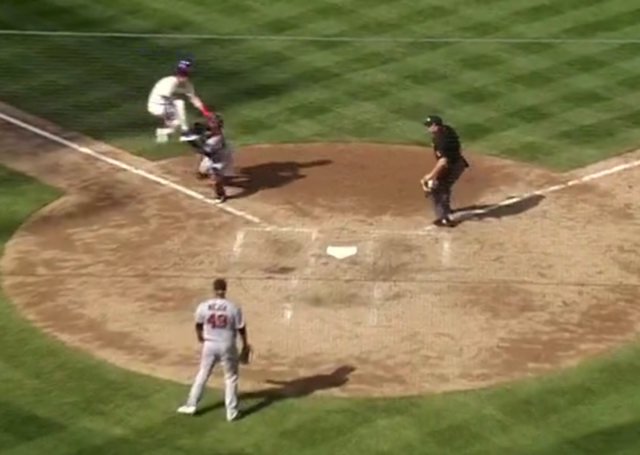 In the first, R3 is clearly completely in foul territory, and F2 completely in fair as he receives the ball. In the second, R3 starts to leap along the line he has taken to the plate. F2 begins to move his mitt toward R3 to make the tag. The fact that F2 must turn and move toward R3 tells us that R3 is not going over him. In the third, F2 has to move his feet to get to the leaping runner. Clearly, R3 could not be directly above him. I can't fathom why anyone would look at this play and rule it hurdling. But if you do, I suppose you're entitled to your opinion.